Issue ... How do you keep informed or alerted about the changes to vital document content (new or updated documents), when the information is spread over a diversity of your Notes databases? Firstly, how do you collect the required information, and secondly, how do you disseminate it to a portal page on your Domino intranet or to a "webfeed" page on your Domino Internet site? NotesTracker provides a simple yet elegant solution to address this common issue. You can do this very easily, via a unique "generic" capability provided by NotesTracker that is quite simple to implement. You simply set up NotesTracker to track the required documents (those that will appear in the Breaking News view). Then, via the NotesTracker Configuration document in each database, you direct the usage log entries to a common NotesTracker repository database, and in that database create the view that you want to appear (as an embedded view) on your portal page (intranet or Internet). The distributed NotesTracker Database contains such a "Breaking News" view. You can use this live working example as an example or pattern. All of the design issues have already been resolved for you, and you only need to copy its design into your Notes or web Portal Page (as an "embedded view"). To see it in action, simply create a few documents in the other example evaluation databases (R4.6 discussion database, Yellow Pages, Domino Directory, and Customer database). 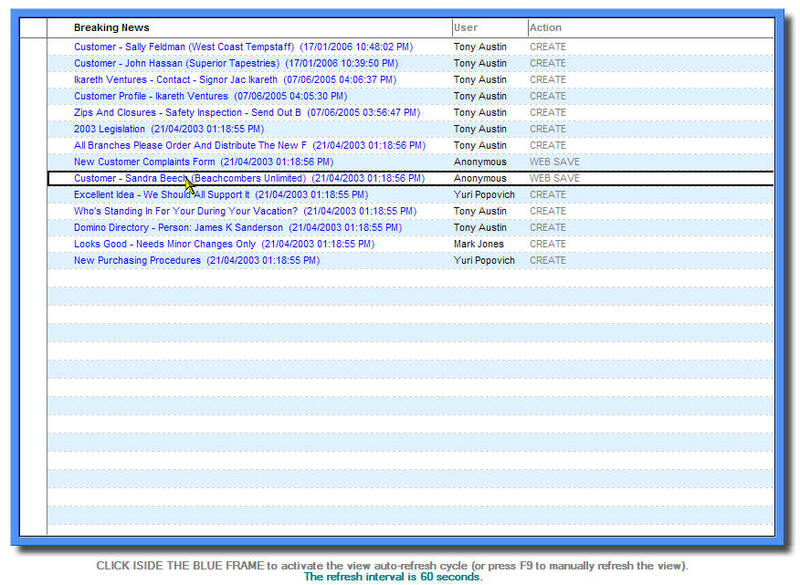 As you add documents to these databases, they automatically appear at the top of the Breaking News view every time that the view is refreshed. It is refreshed automatically (every 30 seconds - see below), or you can press F9 to refresh the view at shorter intervals. The view is composed of such newly-created documents, sorted in descending date order. By means of appropriate View Selection formulae acting as "filters" your Notes developer could easily create for you a variety of "What's New" views for display on different portal pages (or anywhere else where embedded views are possible). Merely by double-clicking on a document in this view, such as "Safety Protocols To Be Followed In Bridge Design", you can open it for deeper investigation. You might leave your portal page window untouched for some time. During that period new documents it is likely that new documents have been created in one or more of the application databases being tracked. Such newly-created documents normally will not appear in the Breaking News view until you refresh the view (by pressing the F9 key). This is an inconvenience, not good for keeping apprised of the latest documents in a timely fashion. To overcome this problem, the example Breaking News view incorporates "timer" code that refreshes the view automatically, and periodically. In production, you would decide on, say, a ten-minute or fifteen-minute refresh interval. The interval could be longer, hourly for example, if documents creations or updates are infrequent. In NotesTracker Version 5.0 the view refresh interval is selectable (per database) between 5 seconds and 2 hours (in prior releases it was fixed at 60 seconds). How would you make use of this "What's New" style of view? Essentially, whatever may be built into a meaningful Notes view may appear in such a portal page view (in a Lotus Notes Client or a Web browser environment). The included documents need not be just newly created ones (as in the above example), but can be document Updates (or even Reads and Deletes) as well as or instead of Creates. Many interesting sorts of feeds can be created just by "filtering" any sort of document collection via View Selection formulae and sorting the documents in any way that is useful. This is just a matter of simple, easy Notes view design; you can select and sort by date, author, reader, or any other document field value. You can build a number of different views, each designed to fit best in a given intranet or Internet portal. Each view can be based on a single document source, or could aggregate Notes documents from different sources, dependent only on how you configure your NotesTracker logging options. No portal feed design and construction could be simpler or more flexible and adaptable! See also: What Are Webfeeds, and Why Should You Care?